Miami was unable to pull out a win in a game that came down to the closing seconds. North Carolina held on to outlast Miami 66-65. After allowing a 20-point comeback to North Carolina State in their previous game, the Hurricanes (18-9, 8-6 ACC) came ready to face the 17th-ranked North Carolina Tar Heels (22-6, 9-5 ACC). Michelle Woods led the charge for Miami with 11 of her team-high 18 points coming in the second half. North Carolina’s big three of sophomore guard Allisha Gray, sophomore forward Stephanie Mavunga and junior guard N’Dea Bryant combined for 40 of the teams 66 points. Gray dropped 14 points and made her presence felt at all times on the court. Stephanie Mavunga needed help, leaving the court midway through the first half after injuring her left knee. Mavunga returned for the second half wearing a large brace, but it didn’t slow her down. 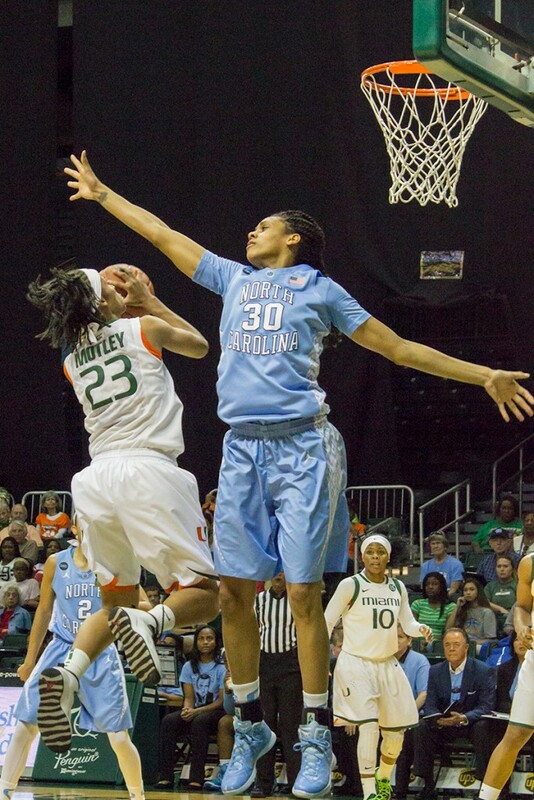 She scored 14 points and grabbed 14 rebounds against a Canes team that seemed unsure of how to stop her. Miami went on a last-minute run, trying to force overtime but squandering a last-second opportunity. Coming out of a timeout with just 7.5 seconds left and trailing by two points, Erykah Davenport made a cross-court pass to Necole Sterling, who had a foot out of bounds. North Carolina’s Jamie Cherry then knocked down two clutch free throws to extend the North Carolina lead to four points and put the game out of reach. “Our last possession we got the look that we wanted; we just didn’t execute the pass,” Meier said. The Hurricanes’ next matchup will take them to Winston-Salem, North Carolina to face Wake Forest at 7 p.m. on Thursday, Feb. 26.